Blood and Beauty by Sarah Dunant was a random choice by me from the library. I enjoyed watching/listening to Sarah Dunant when she used to be on TV some years ago when she presented the culture programme The Late Show, so I thought I’d give her writing a whirl. 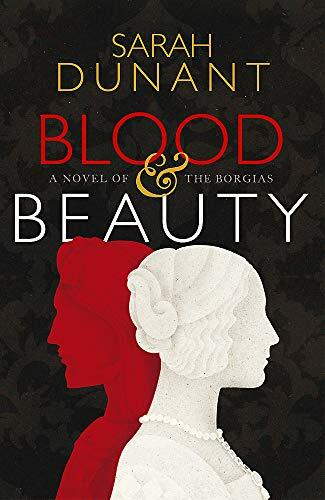 The setting of Blood and Beauty is mainly Rome, the Vatican and when the book begins it’s 1492 and a new Pope has just been elected. Rodrigo Borgia has got the top job of God’s representative on earth, he’s a politician and worked hard to get what he wanted. Although he has lived in Italy for years he’s still seen as a foreigner, a Spaniard looked down on by many but he has bribed his way to the top job, the other cardinals couldn’t resist his gold. It seems not to have been a problem that he had six children and never had any intention of sticking to his vows of celibacy, but that seems to have been normal for those days. He became Pope Alexander VI. In essence he used his children as pawns and married them all off to the various important and powerful families in the neighbouring countries. He was a similar type to Henry VIII but of course the pope could just decree any marriage to be dissolved if he became unhappy with his choice of in-laws. So he didn’t have the same problems as King Hal. In fact it might be fairer to say that Rodrigo Borgia resembled Henry VIII’s politicians and advisors as they were the ones keenest to form alliances with other countries. Anyway Pope Alexander’s son Juan was very much his favourite and he made that obvious to everyone which caused a huge amount of jealousy and resentment especially within the family, particularly where his son Cesare was concerned. But as Juan was spoiled rotten his behaviour was always going to make him plenty of enemies. It isn’t going to end well! I decided to read this book because I thought it would be a painless way of learning about the history of that era, and so it turned out to be. The only thing that I knew about his daughter Lucrezia Borgia was that she had a reputation as a poisoner, but so far she is a much used and abused daughter, sister and devastated widow. This book has a sequel (I think it’s out in 2017) and I’ll definitely be reading it but I must say that if Lucrezia does resort to poison eventually, I won’t really blame her too much. I don’t think this is a brilliant book, it isn’t in the same sphere as Wolf Hall but it is very readable. Mind you, I was watching something on TV quite recently and the historian mentioned that although at the time someone was thought to have been poisoned (I can’t remember who) it’s now thought more likely that they died of a burst appendix! What a thought – there must have been loads of people over the years who were accused of poisoning people who had just died of what we now know as being unfortunate health problems such as appendicitis, peritonitis, perforated stomach ulcers, food poisoning and such. At the end of the book there is quite a long bibliography and I might read one or two of those books too. Well, I would like to but you know what it’s like – too many books!